I’ve been thinking a lot more about family ministry since having kids of my own 3 years ago, but somehow in the past year or two it’s been more in the forefront of my mind. It’s shifted from being part of my ministry philosophy to being an essential part of ministry values for me. A lot of the family ministry conversation seems to revolve around, “How do we minister to the family as a unit?” and, “How do we help parents take spiritual responsibility for their families?” While these are noble questions, I feel like we’re only getting as far in the conversation as the depth of the questions we ask. There are more fundamental beliefs that are actually driving these questions and the direction we feel we need to go with family ministry. The questions we ask are actually rooted in our belief system about the church, the role of the family, and the responsibilities we hold as pastors. If we ask better questions, I believe a lot of the “how to” questions will become self-evident. As I head into the D6 Conference next Tuesday (September 26-28), I’m hoping to hear speakers who are addressing the deeper issues of what we believe about the church and ourselves as leaders. I expect those types of conversations will be extremely helpful for me. But even if we don’t get there, the normal family ministry conversations will still be helpful in that I’ll hopefully understand a bit more clearly where the church is coming from and the beliefs we hold that lead us to ask the questions we’re asking. I’d love for you to join me in this thought-journey next week! While I’m at the conference I’ll be tweeting @timschmoyer a lot and posting thoughts to the Life In Student Ministry Facebook Page. It’d be great if you’d process with me some of the things I hear and see, especially during the sessions that are streamed live online. I’ll be pretty active in the live chat adjoining each of those live video sessions, which you can watch for free here. 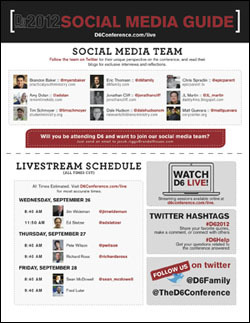 Check out the schedule for when those sessions will be live streamed from the conference. I’m looking forward to immersing myself with you in the discussion next week. I trust the Lord will be glorified as it helps our ministries be more honoring to Him and to the people He places before us.